Our brand-new free gift is a sample from our new Beauty Expert - Brow Design Kit! 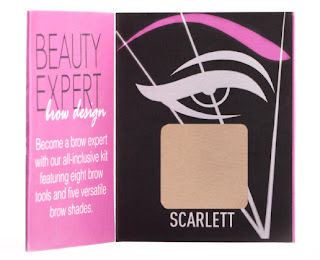 The brow powder shade Scarlett is incredibly versatile and works with any hair color. The gift is a great introduction to our full Brow Design Kit and a great opportunity to try out our latest product! Sigma also offers this informative video tutorial on how to properly apply the Scarlett brow powder. Check it out here: Scarlett Brow Powder Tutorial. This unique free gift is a great way to market the full Brow Design Kit to your followers! It is available to customers with qualifying* purchases of $30 or more. Make sure to spread the word about this brand new gift to your followers! *Note: Offer begins September 18th. Available while supplies last. Sub-total must be over $30 at the time of checkout to receive free gift. Thats a nice gift. One quick question:this can be used as eyeshadow too? Voltarei sempre! Visite o meu e siga também. great i just made a post about sigma in spanish and post a picture of this gift! :D thanks! Thank you for the suggestion! As the post states, the sub-total of the purchase must be over $30 to receive the free gift (not including shipping). Is the sub-total calculated before or after a 10% discount code? I started posting in my blog everything about Sigma as the cupom codes. Please click on the word Sigma Beauty and see the posts. Below the link straight to the posts. im new to this where do i blig? where are the codes? and the 10% off that icould ptovide to people how do i use that i know someone who stated on yotube use code for 10% off and it was a code that had her name? The new free gift is the travel sized E25 brush! Hi, do you know what the free gift is going to be for September? thanks! The current free gift is the E25 mini! Hi! Would it be a new gift for november? thank you! The current free gift is the E25 mini brush (this will continue throughout the majority of November), thanks! Is the E25 mini brush still available as the current free gift til the end of November? Thanks! The free gift is now the E05 mini eyeliner brush! Is the gift still the mini e25 if I ordered on November 23rd? Is it possible to get mini E25 as a free gift, if I order in December? The current complimentary gift is the mini E05 eyeliner brush! I hope its still the eyeliner brush gift? Yes, it is currently the E05 eyeliner brush! Can you buy that separately on any website?